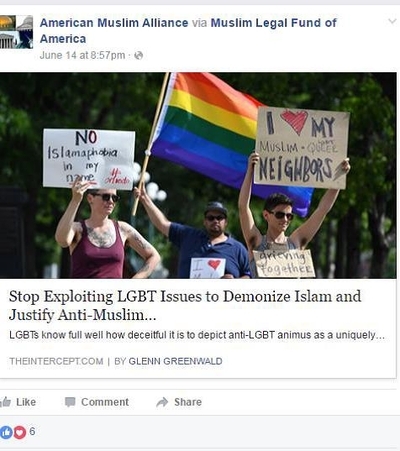 The father of Orlando mass shooter Omar Mateen has longstanding connections to prominent Islamist groups in the U.S., a document discovered by the Investigative Project on Terrorism shows. Seddique Matin is listed as president of a then-new American Muslim Alliance (AMA) chapter in Fort Pierce in a July 1997 announcement archived by the IPT. The AMA sponsored several radical conferences in the U.S. and its leader, Agha Saeed, has spoken in defense of convicted terrorists, including Aafia Siddiqui (a.k.a "Lady al-Qaida"), Palestinian Islamic Jihad board member Sami Al-Arian, and Pakistani intelligence lobbyist Ghulam Nabi Fai. 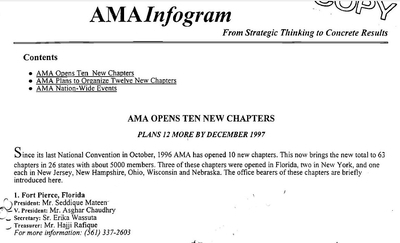 The Fort Pierce chapter is among 10 new AMA chapters opened, the announcement in an AMA bulletin says. AMA was incorporated as a nonprofit organization in California in 1994 "to educate the Muslim community and others on the history and laws of the United States and on affirmative participation in civic activities on a non-partisan basis." AMA's political activist wing, the American Muslim Political Coordinating Council (AMPCC), includes leading Islamist organizations in the U.S. including the Council on American-Islamic Relations (CAIR), the Muslim Public Affairs Council (MPAC), and the American Muslim Council (AMC). 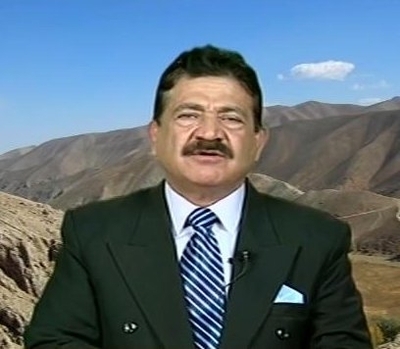 In October 2000, AMA co-sponsored a rally in Washington's Lafayette Park where AMC's then-executive director Abdurahman Alamoudi announced his support for Hamas and Hizballah. In 2004, Alamoudi was sentenced to 23 years in prison for illegal financial dealings with Libya. He also confessed to taking part in a Libyan plot to assassinate then-crown prince of Saudi Arabia. In 2003, Saeed testified on Al-Arian's behalf, describing the man who ran "the active arm" of Palestinian Islamic Jihad as "my friend and during the last ten years we have worked together to mainstream American politics. We have worked together to replace the culture of despair with culture of hope and the culture of bullet with the culture of ballot." AMA's website also featured a section entitled "Valiant Civil Rights Struggle of Dr. Sami Al Arian." Saeed also penned an op-ed along with CAIR's then-national board chairman Parvez Ahmed that called for Al-Arian's release from prison during a subsequent contempt case. The op-ed criticized U.S. counterterrorism efforts claiming "the saga of Dr. Sami Al-Arian is a repeat of past incidents in American history in which our government targeted individuals using unconstitutional and un-American tactics." Saeed advocated "armed resistance" at a 1999 Islamic Society of North America (ISNA) in Chicago: "United Nations has a resolution...which says... people in Palestine have the right to resist their oppression by using all means including armed resistance...." Saeed was featured as a guest speaker at Islamic Association for Palestine (IAP) conventions. Evidence unearthed in a Hamas-financing trial in Dallas, showed IAP served as a propaganda machine for the terrorist group in the U.S.
At AMA's 7th Annual National Convention in October 2002, Agha Saeed indirectly blamed the U.S. for the 9/11 attacks. Osama bin Laden was contemptible, he said. "But I would like to say very respectfully, who brought Osama bin Laden from Saudi Arabia to Afghanistan? Who gave him million[s] of dollars? Who trained him in [the] science of war, death and destruction, deception and deceit? Who gave protection to his cause and diplomatic coverage to his enterprise? Was it not President Reagan, when he had to see mujahideen at the White House, he said, 'When I meet you I feel as if I am in the company of the founding fathers of this country?'" Good information from your group, I would like to suggest that you research the possibility that all these terrorist have a father who has intermarried with their first cousin or other close family member and to try to link the mental deficiencies of these terrorist that could be the cause of their mental state that causes these people to want to be cajoled into being a suicide bomber or to take out their aggressive behavior toward women or use a gun to kill all the people that they have in the past and will kill in the future. I would like to see a serious discussion on this topic, So far I have not seen anything in the media about this condition. San Bernadino shooters family also had ties to Islamists. Seems to me most violent Islamists come from Islamist sympathizers, at the very least. Also when I see CAIR jumping in to support families of Islamist killers, I usually suspect the whole family. Gee what a surprise. Never mind, your President and his protege are working hard to dismantle the 2nd Amendment so there is some hope that gun restrictions will prevent , um, ordinary American Infidelophobes from buying suitable guns in the US for mass murder of Islamophobes. Still, they will easily be able to import decent automatic weapons through the wide open US/Mexican border.